Hello! I hope you all enjoyed your Valentine's Day yesterday, whether or not you celebrated the day designated for love! 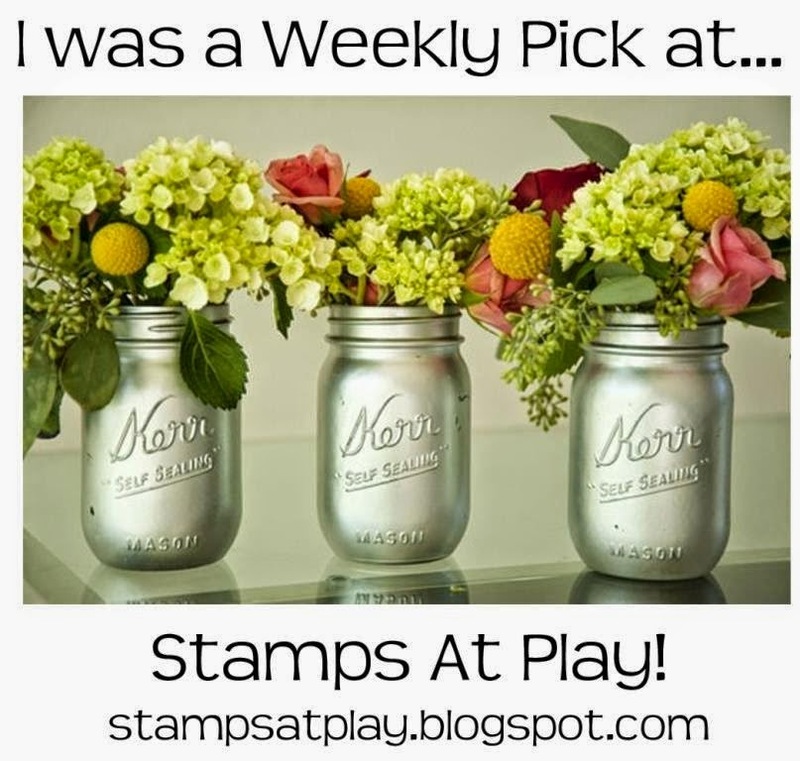 Today I am sharing a card that fits the bill for Romance, our theme for February on the Auzz Trinklets and Crafts blog. This card uses Neenah Classic Crest 110lb Smooth Solar White Cardstock for the base which is cut with a paper trimmer at 4 ¼“ x 11” and scored with a teflon bone folder at 5 ½“ to make a top folding card of 5 ½“ x 4 ¼”. 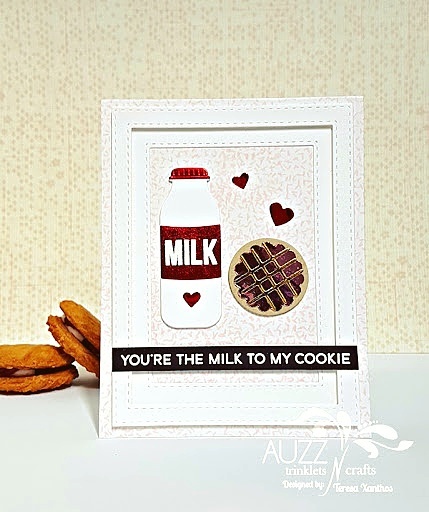 I chose My Favorite Things Cookie Crumbs and the coordinating My Favorite Things Dienamics set You're the Milk to my Cookie for this project. I used the sprinkles/hundreds and thousands stamp meant for a cookie and stamped it multiple times onto the card base with Altenew Crisp Dye Ink in Frosty Pink. The layered frames were die cut from Neenah Classic Crest 80lb Smooth Solar White Cardstock with Simon Says Stamp Stitched Rectangles dies. I lined up the outside die with the third largest die to create the first frame and then used the outside die with the second largest die to create the top frame and adhered them together using 3M Scotch Double Sided Foam Tape and stuck these to the card base with double sided tape. I cut four milk bottles from Neenah Classic Crest 80lb Smooth Solar White Cardstock and glued them together to create a dimensional piece and did the same with kraft cardstock to create the cookie, using the larger of the two circular dies in the set. 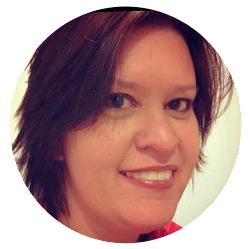 My Heidi Swapp Minc machine then came into action. I foiled Heidi Swapp Minc Sheets using Heidi Swapp Reactive Foil in Light Pink, iCraft Deco Foil in Red and iCraft Deco Foil in Gold. 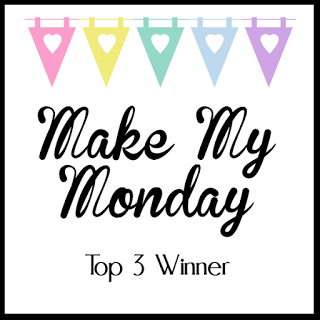 I then used dies from the MFT set to diecut the pieces I needed from the different colours of foil using my Sizzix Big Shot machine. The heart dies came from the Sizzix dies set that coordinate with Tim Holtz's Stampers Anonymous Crazy Things stamp set. The foiled pieces left over, I put away for future projects. I used a shim when cutting the lid for the bottle so the debossing was a little deeper and more obvious. 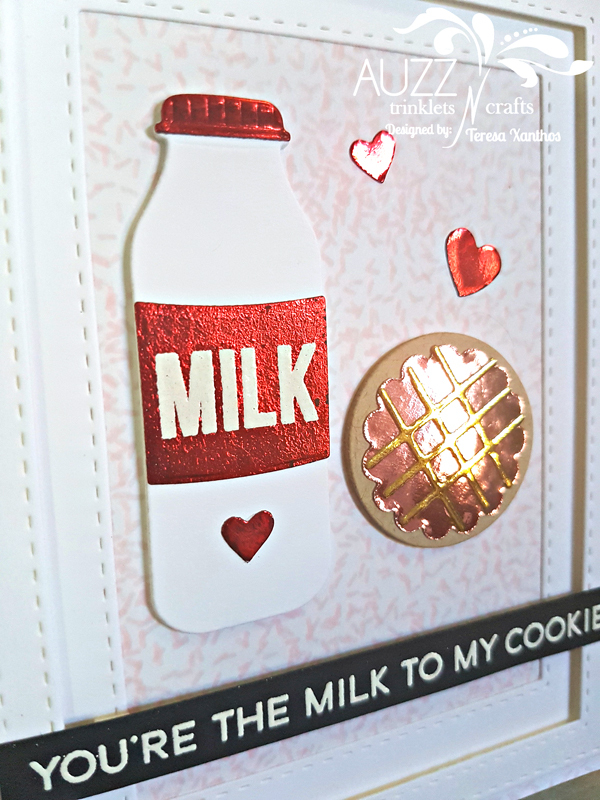 I took the label for the milk bottle and heat embossed the word milk from the MFT stamp set using Versamark ink, Hero Arts white embossing powder and Wagner heat tool. Prior to stamping, I used an EK Success Powder Tool on the foil to prevent stray embossing powder from sticking in places I did not want it, then wiped away the powder once the embossing had cooled with a microfibre cloth. I was not sure how the foil would react to the great heat of the tool, but was happy to see that it provided an interesting effect and a wonderful texture. I think I will be using this technique again as it would be perfect for a vintage look. I glued all the pieces together and placed them onto the card base using Ranger Multi Medium Matte before stamping and heat embossing the sentiment from the MFT stamp set with Hero Arts white embossing powder onto a strip of black cardstock which I adhered with 3M Scotch Double Sided Foam Tape. Again, I used the EK Success Powder Tool prior to stamping on the black cardstock, wiping the powder away with a microfibre cloth after the embossing was done. I showed this to my husband once I had finished and he asked if he could write in it and give it to me. Ha!